Japan. Seriously, just read this sentence about the plot: After King Ghidorah was resurrected as Mecha-King Ghidorah, the human characters determined that Godzilla must increase in power, and so Godzilla had to seek out the three capsules of Super S energy, only then would the monster transform into the godly stature of Super Godzilla. Best time: 0:43:31 by Wesley 'Molotov' Corron on 2014-03-20. For some reason, I've been on a Godzilla craze for a while now. I tend to buy merchandise I otherwise wouldn't, because my brain goes, "Godzilla? AW YEAH!" This is what happened to me last year in late November. I was visiting Mike Uyama to stream Awesome Games Done Quick 2014 practice (I don't have the internet connection for it) and we decided to take a trip to the eStarland warehouse. Aside from the fact that it's an amazing store that would drain my bank account if I lived nearby, I also found a copy of Super Godzilla there. I figured that all Godzilla games are bad, but I couldn't resist buying this one anyway. To my surprise, the game is actually decent. It's certainly no masterpiece, but it's enjoyable and has some interesting boss fights. It's also speedrun-friendly, which is something I didn't really expect. You'd think that a game with auto-movement and a slow pace would be bad for this, but route planning and boss strategies more than make up for it. Unfortunately, it also has some RNG that affects the run. I've had enough experience with RPG running that this wasn't a huge problem, but it did get irritating to lose runs about 18 minutes in because of bad luck. 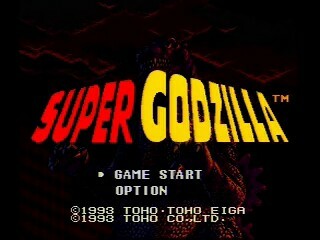 - Godzilla auto-moves on the map screen and you just control his direction. - Grass/city tiles are quick to move across, water tiles are slow, and deep water tiles are a nightmare. Detonated land mines are very fast to move through. - Destroying buildings or mountains is usually slower than moving around them. Sometimes it's worth it to avoid extra tiles for UFO spawns (more on that later). - You can't move through tall buildings or mountains. Apparently, Godzilla is wimpier than he looks. - There are four attacks you can use in battle (from weakest to strongest): tail whip, body strike, fire breath, and hyper fire breath. - The blue meter in battle determines which attacks are available, but they are still selected at random as you back off. It's possible to get a blank slot. - Each boss has its own biorhythm and that mostly determines how you need to fight it. - Bosses can use special attacks on you too, but not while you're blocking. - UFOs start spawning from stage 2. The little ones are random encounters, but it seems that they can't spawn on special tiles (land mines, for example). - Colliding with an enemy usually damages both parties. Knockback depends on the enemy and can be exploited for very quick damage. Stage 1: The first reset point happens immediately, because King Ghidorah has two potential spawn locations. I wanted it to appear in area 1-B, so I had to reset if the "enemy" (distance) counter said anything other than 288. The route to the boss is straightforward. I don't go through the water at the start because it's slower than tearing down the building. I go up and right after that, since I found out it's actually faster than my old method of hugging the bottom of the map. The gold orb is just a full HP refill, so it's completely useless. I wasn't lucky enough for King Ghidorah to make its way toward me, but that's ok. It still behaved more than some of my other attempts. The fight strategy is total lockdown and my goal was to never allow King Ghidorah to use a special. I can't afford to let it get out of the corner, because its biorhythm is all over the place. If I screw up and bump into King Ghidorah, I usually get launched back and the attempt is over because a special is almost inevitable. All attacks do decent damage at this point, so I can afford to use a bunch of quick tail whips and body strikes without much issue. It would probably be faster to use hyper fire breath repeatedly, but I couldn't figure out a way to quickly and easily charge up my meter. Unlike some other bosses, King Ghidorah seems to spend most of its time in "I'm about to freaking kill you" mode when it comes to the bar. It has low defense though, so using quick attacks works out well enough. Stage 2: HP is almost irrelevant in this stage, so I take a lot of damage to save time. You can't fight Mechagodzilla until you destroy the UFO mothership, so I take care of that first. For the small UFOs, the plan is always to ram, punch, and ram. If I just ram them the whole time, I'll end up taking far more damage than necessary (something like 70+ compared to about 25-30). I think it's also slower to skip the punch, since the UFO takes less damage per collision that way. Also, I should note that I don't run from small UFOs unless I'm within a couple spaces of a boss or mothership. That's because they will chase you and your encounter rate will be incredibly high until you take it down. While the small UFOs always do the same thing at the start, the mothership is entirely random. It likes to let you get close before retreating into the air beyond your reach, and then hover there for a long time. My goal is to ram it until it stops taking much damage. After that, I punch it and back off before coming back for more. This keeps me from taking a huge amount of damage (which can easily lead to suicide), but it also gives the mothership another chance to retreat into the air. The mothership behaved nicely this time though, so it wasn't a big deal. My old plan for Mechagodzilla involved picking up a blue orb for a small HP refill. I needed this because my plan was a lot like the one for King Ghidorah. This was fine, but unlike King Ghidorah, Mechagodzilla can't be stunlocked out of a special. This meant that I was at the mercy of the RNG for how many times it wanted to counterattack me after tail whips and body strikes. The new plan might look slow, but according to my emulator testing, it's slightly faster. I don't need to worry much about HP either, so I could skip the blue orb. Mechagodzilla has two phases for its meter: fast and gradual. It begins the fight in gradual mode and slowly builds meter up to a certain point before draining again. This is my opening to approach, since I won't be attacked if I get in there and punch quickly. The fast phase is trickier, since it fills up fast, drops, and then fills up to a dangerous point before dropping again. The second spike is a problem, since it's very close to the point it needs to use a special on you. Moving in too fast during the drop after the first spike will usually lead to trouble, so I try to stay put during that phase. I also learned that blocking was a good idea before the second spike, because Mechagodzilla randomly decides to use a special on you anyway and that's not fun. Other than that, you can see that I spend the entire fight watching my meter and gauging my distance. I wanted to have my meter somewhat full when Mechagodzilla's meter was near the top of its gradual phase, but I also wanted to be a good distance away when that happened. This allowed me to fill the meter a bit more before the punch, so that I could almost guarantee a hyper fire breath attack. Stage 3: This is the most important reset point and it depends entirely on the RNG. There are six labs that the professor could be in, but only the closest one is acceptable for a run. This wouldn't be such a problem if it wasn't for the fact that you need to rescue the professor before Biollante will appear. After you find him though, the fun isn't over. There's an annoying glitch to exploit in the Biollante fight and, if I fail, the run is over. You normally need to defeat both feelers to begin attacking Biollante. However, the programmers screwed up and must have put this check on only the back feeler from when the fight starts. Since these things move around during the fight, it's entirely possible to defeat the back feeler first. If you do that and then escape from the fight, the game assumes you've defeated both. This sounds fine, but then it gets very confused about how the fight should proceed. When you re-enter the fight, the front feeler is still there and doesn't move. You can actually walk through it and attack Biollante directly, at which point the game gets even more confused. From here, the feeler disappears entirely and Biollante is stuck being unable to do anything. This leads to hyper fire breath spam, because it's the fastest way to deal damage. The only downside of this glitch is that both feelers look exactly alike. They sometimes like to overlap each other, so unless I get at least one confirmed hit on the back feeler early, I'm practically screwed if I lose track of it at any time. If I can get at least one hit without touching the front feeler, I can just resort to waiting for double hits. That's basically what I did here, because I was being extremely careful not to lose a good run. It was worth the time loss to ensure I wouldn't lose a run from something stupid like that. Stage 4: I pick up a bunch of items on the way to Battra to be safe. The blue orb is because of the mine string I cross, which usually leaves me at very low HP. The red orbs are for quickly raising my meter, since Battra can only be hurt by hyper fire breath (which requires a high meter). The invincibility pickup was random, but I was somewhat hoping for a green orb (temporary invincibility in battle). It turns out that neither were really necessary, but I was covering myself in case the Battra fight turned ugly. I've died in that fight more than once and it's not funny. The fight plan for Battra is an interesting thing. I spent a long time in practice trying to come up with elaborate methods to get in there without being hit with a special, but in the end, it turns out that charging blindly is the way to go. Battra doesn't like it when you play that aggressively and can't do much to stop you. You push it back a good distance with each collision, so it's easy to stick it in a corner when it's not on a rampage with its own charge attacks. In my experience, it tends to avoid using a special as long as you don't stop moving for more than a second or two at a time. So even when it's off the screen, I continue to charge at it to keep the meter up and stay (reasonably) safe at the same time. Stage 5: This stage is the last place where the RNG can ruin the run entirely. The goal is to defeat Mecha-King Ghidorah before the city takes 50% damage. At 50% or higher, the research lab will be destroyed and you'll lose three minutes (!!!) on stage 6. Normally, you'd need to choose between visiting the three power stations and transforming into Super Godzilla, or going straight to Mecha-King Ghidorah. Super Godzilla makes the boss fight a joke and the latter means you're in for a real struggle (I've done it once though!). If you're really careful about your route and get lucky though, you can get Super Godzilla and still make it there in time. Stage 6: With the research lab still intact, all I need to do is visit it, transform, and stomp Bagan. I was a little confused about my route to the lab, since I came out of a slightly different spot in stage 5 than I usually do. My short-term memory failed me because I was preoccupied with thinking about the Bagan fight, so I ended up needing to make a judgment call on the trip to the lab. I decided to go down a little earlier than I normally would have, but it was a good call. I had forgotten that quickly about the fact that I just came out of there earlier. The Bagan fight is never anything but trading blows. Unless Bagan is really close to me or high on meter, I try to hold my super punch until the bar starts to rise for a second time. This usually gives me fire breath, which is an efficient way to deal damage. The nova beam would be ideal, but I couldn't risk holding out for it. After each special I use, I need to block. Bagan almost always counterattacks and it happens very quickly, so it's best to just plan for it and stop blocking if it doesn't happen. Sadly, Bagan is the only boss that cheats when it comes to specials. Its ramming attack hits multiple times and has a random chance of breaking your guard. It then uses this opportunity to slip in a special before you can do anything. I was almost able to get a run without any enemy specials, but then Bagan had to go and cheat at the very end. What a jerk.